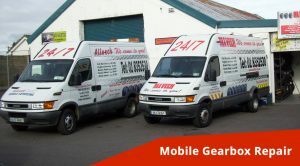 With years of experience, we are Finglas’s premier mobile gearbox mechanics. We specialise in “on­ the­ go” gearbox repairs & service to your car, van or truck, wherever you are. This means we can come to your location if you need a gearbox check or fast repair completed 24 hours a day. From supplying and fitting parts to complete gearbox rebuilding, our team are on hand to help you get back on the road as soon as possible. As our name suggests, we cover all makes and models of vehicles. If you drive a van, truck, or car, we can repair or replace your gearbox in no time at all. We handle repairs and replacement for both manual and automatic gearboxes. Any repairs to your vehicle can seriously impact your schedule. That’s why we offer a professional, fully mobile service. We’ll come to your location, whether at home or work, and carry out the gearbox repair or replacement at a time that works best for you. Not sure if you need a gearbox repair or replacement? If you’re not 100% sure, why not take advantage of our free quotation service? Call a mechanic directly now on 087 310 1393. We’ll advise you, and if you need, can send one of our qualified mechanics to your location to assess your gearbox immediately 24 hours a day. In today’s hectic world, it’s hard to make time for everything. AllVech makes your life easier by coming to you for all services and breakdown assistance. We strive to give you the best possible service at excellent rates. I had Shane from Allvech come out to my home in Finglas to repair my Gearbox. Leaving to the last minute wasn’t clever, but needless to say he got my car up in running in no time.